alaTest has collected and analyzed 684 reviews of Asus Transformer Pad TF103CG. The average rating for this product is 4.1/5, compared to an average rating of 4.3/5 for other products in the same category for all reviews. People really like the screen and performance. The price and portability are also mentioned favorably, but there are some mixed reviews about the touch screen and battery. We analyzed user and expert ratings, product age and more factors. Compared to other products in the same category the Asus Transformer Pad TF103CG is awarded an overall alaScore™ of 87/100 = Very good quality. 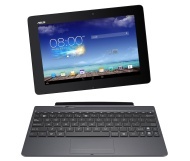 alaTest has collected and analyzed 10 user reviews of Asus Transformer Pad TF103CG from Amazon.com. The average user rating for this product is 3.8/5, compared to an average user rating of 4.1/5 for other products in the same category on Amazon.com. People really like the battery. There are some negative opinions about the touch screen. Very easy to use, a little heavy for me, but my mom loves it. Wanted a tablet for school and this had been the best choice. This is the second ASUS Transformer I purchased. The first one I purchased for my husband and this second one for my father. They both love their tablets. They love that there is a USB port.